by Robert Jordan, University of Mississippi. 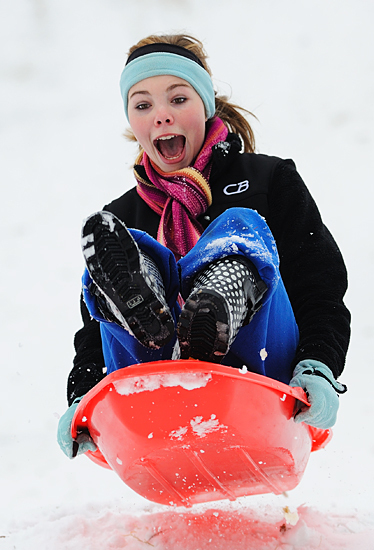 "The campus received over 8" of snow over the holiday break, most students were still at home with family, but a few came to campus to sled on a big hill by Deaton Dorm." 1st Place (301 pts.) - "Slalom Action" by Kelly Gorham, Montana State University. 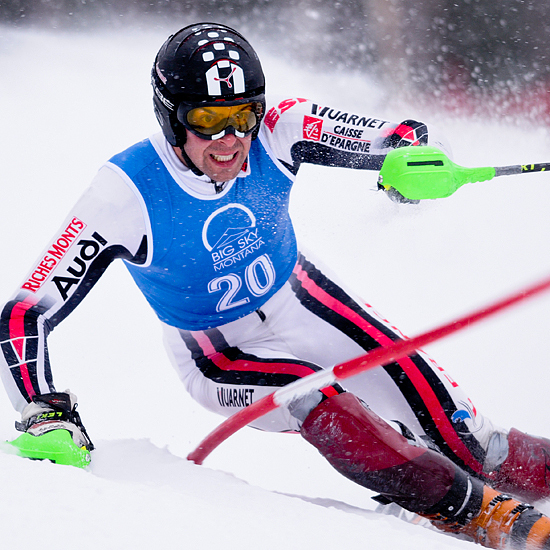 "A racer bashes a gate during the slalom event at the recent invitation ski meet." 2nd Place (299 pts.) - "To the Hoop!" by Robert Jordan, University of Mississippi. 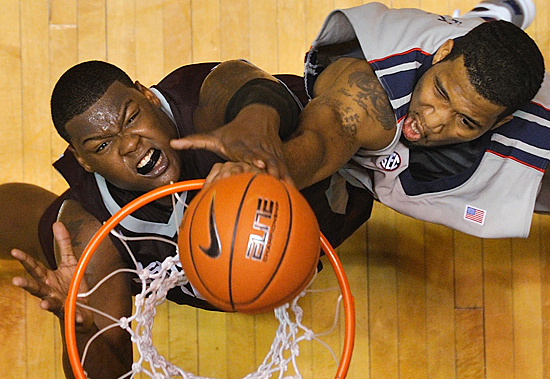 "Cross state rivals give 100% effort on every possession." 3rd Place (261 pts.) - "Scattershot" by Martin Vloet, University of Michigan. "Players move in all directions as the basketball flies from the court (narrowly missing my camera) during play on December 28, 2010." Honorable Mention (256 pts.) - "Morgan and Morris" by Martin Vloet, University of Michigan. 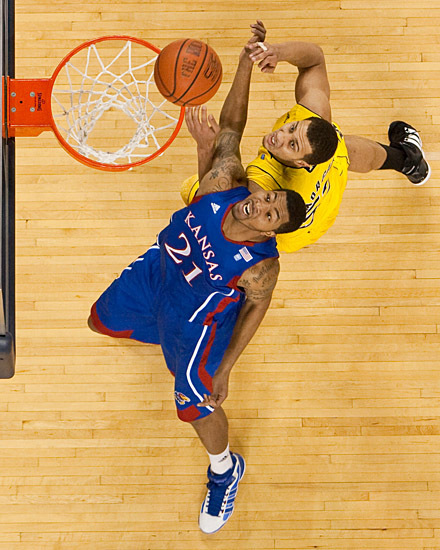 "Jordan Morgan and Markieff Morris battle for position as the ball rattles around the rim at Crisler Arena on January 9, 2011." 1st Place (262 pts.) - "Tennis" by Jaren Wilkey, Brigham Young University. "1/11/11 - Women's Tennis poster shot." 2nd Place (256 pts.) - "Baseball Preview" by Tom Zasadzinski, Cal Poly Pomona. 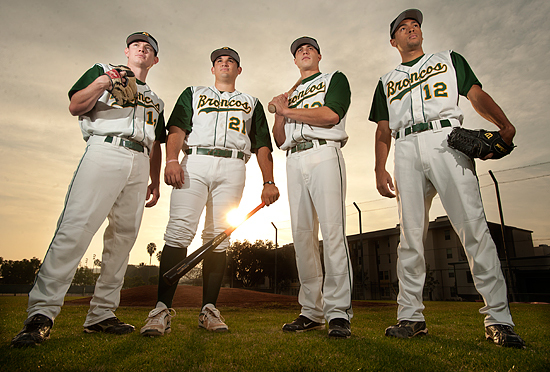 "Kevin Bosson, Geoffrey Broussard Jenzen Torres and Travis Taijeron will lead the 2011 Bronco Baseball team." 3rd Place (255 pts.) - "Big House Light Show" by Martin Vloet, University of Michigan. 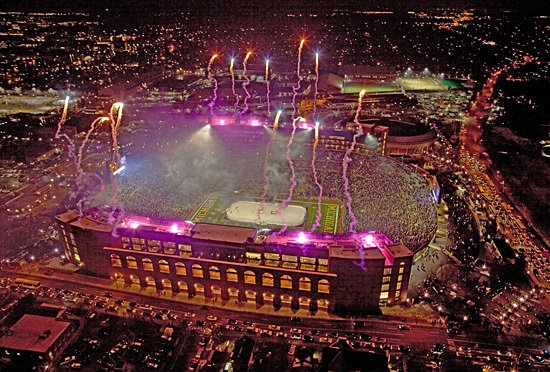 "Following the "Big Chill at the Big House," the sky was ablaze with fireworks. The Wolverines blanked the Spartans 5-0 in front of a world-record crowd on December 11, 2010, and followed the game with a pyrotechnics show." Honorable Mention (254 pts.) - "Putting Pose" by Aaron Mayes, University of Nevada, Las Vegas. 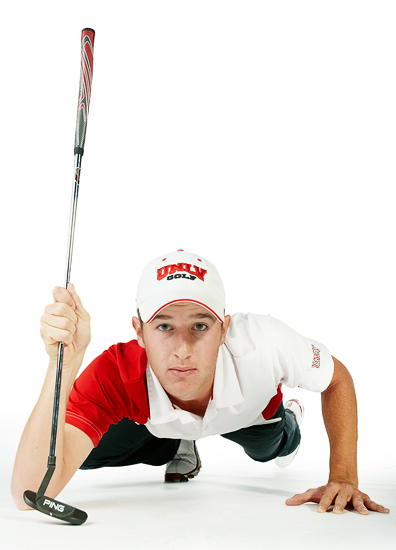 "UNLV Men's Golf team member Derek Ernst." 1st Place (299 pts.) - "Patrick O'Brien" by Bill Hoepner, University of Wisconsin @ Eau Claire. 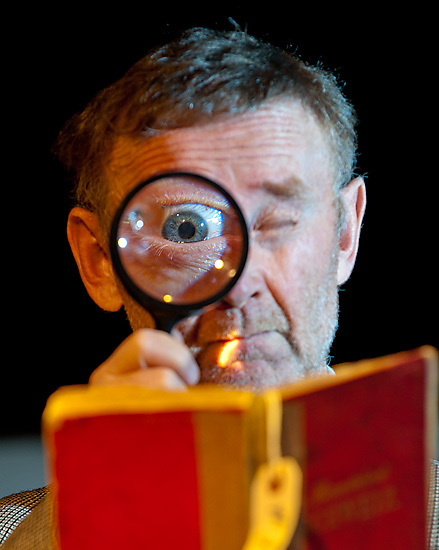 "Patrick O'Brien is an actor and theater producer who has appeared regularly on stage, television and film for more than three decades, alongside such notable "A-list" performers as Tom Hanks, Martin Sheen, Catherine Zeta Jones and Sally Field." 2nd Place (298 pts.) 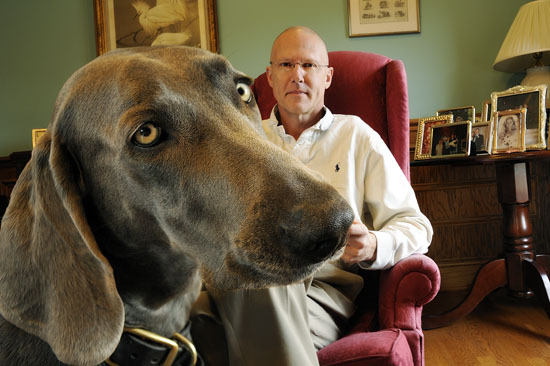 - "It's a Dog's World" by Jim Stroup, Virginia Tech. "Portrait of a neurosurgeon who will be doing a clinical trial on humans using a new type of brain surgery that was developed in conjunction with our vet school performing the procedure on dogs." 3rd Place (265 pts.) - "Girl Rock Camp Founder" by Andrew Tucker, University of Georgia. "Senior Calley Payne is the executive director of the Girls Rock Camp Athens,a local non-profit rock-n-roll camp just for girls." Honorable Mention (252 pts.) 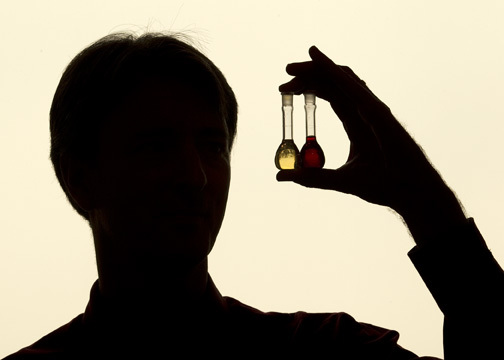 - "Paint Researcher" by Tom Zasadzinski, Cal Poly Pomona. 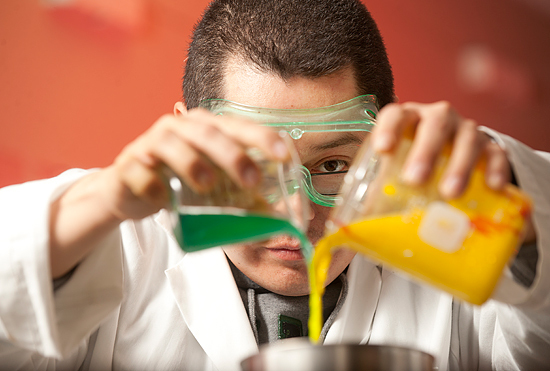 "Jesus Jimenez, a masters student in the College of Science, does research on paint." 1st Place (285 pts.) - "Nanook sunrise" by Todd Paris, University of Alaska Fairbanks. 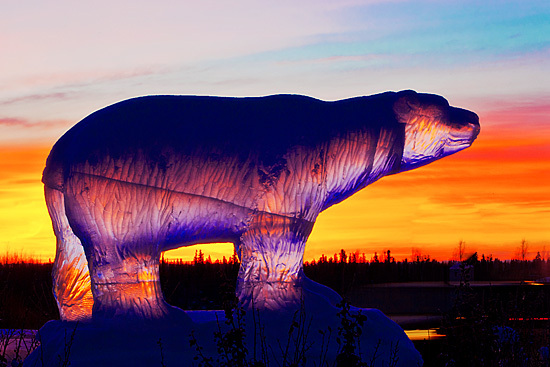 "A spectacular sunrise illuminates the icy Nanook placed in the turnabout near the main entrance to campus." 2nd Place (262 pts.) - "Quiet study spot" by Jeff Miller, University of Wisconsin @ Madison. 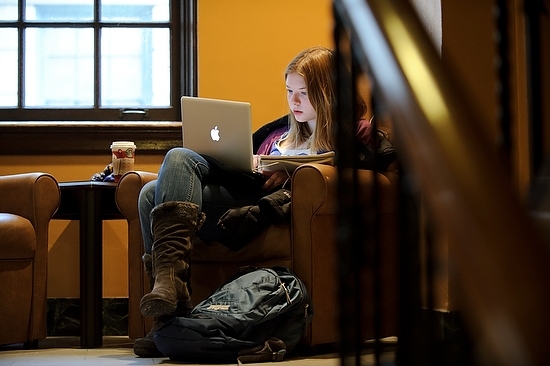 "Undergraduate Caitlin Baker works on her laptop computer while enjoying the quiet of a tucked-away spot in a stairwell landing at the Memorial Union on Dec. 9, 2010." 3rd Place (259 pts.) - "Umbrella Walk" by Tom Zasadzinski, Cal Poly Pomona. 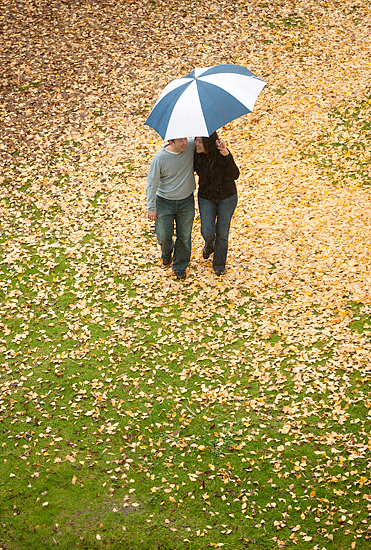 "Esther Chou and Rodney Tanaka take shelter under an umbrella as they walk in the rain near the Rose Garden." Honorable Mention (258 pts.) - "Channel Islands Sunset" by Tony Mastres, University of California, Santa Barbara. 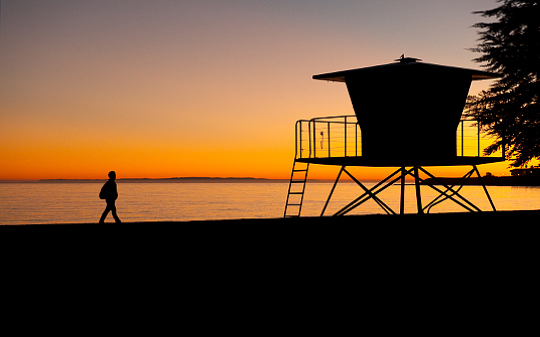 "With the Channel Islands in the distance, a student walks past a lifeguard tower along our campus' 2.5 miles of beachfront." 1st Place (272 pts.) - "Rose Float Construction Sparks" by Tom Zasadzinski, Cal Poly Pomona. 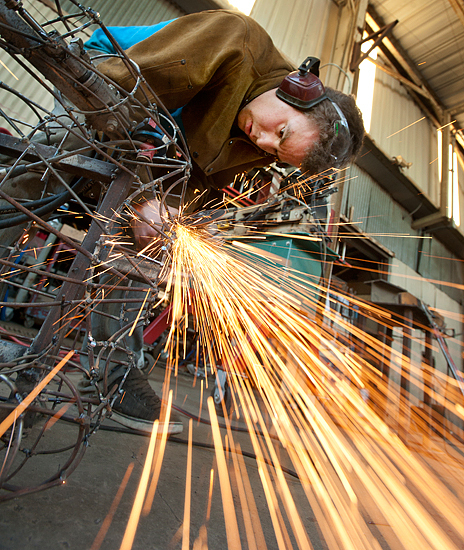 "Ryan Rickard, a electrical engineer from San Luis Obispo, grinds away on a female figurine for the 2011 Cal Poly Universities Tournament of Roses parade float Galactic Expedition." 2nd Place (260 pts.) - "Freerunning" by Aaron Mayes, University of Nevada, Las Vegas. 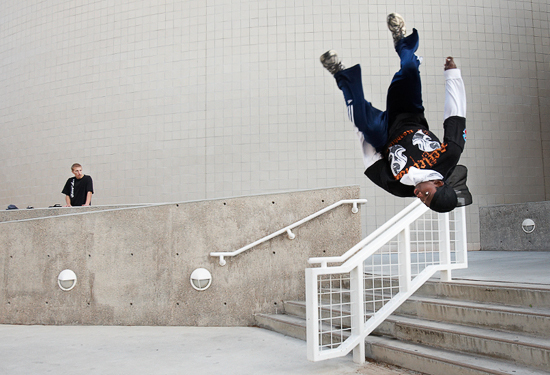 "A student practices a "Freerunning" move as a friend looks on. Sometimes confused with Parkour, Freerunning has a greater emphasis on self-expression, whereas Parkour is more about moving quickly and efficiently past obstacles." 3rd Place (259 pts.) - "Holiday Celebration" by Ken Bennett, Wake Forest University. 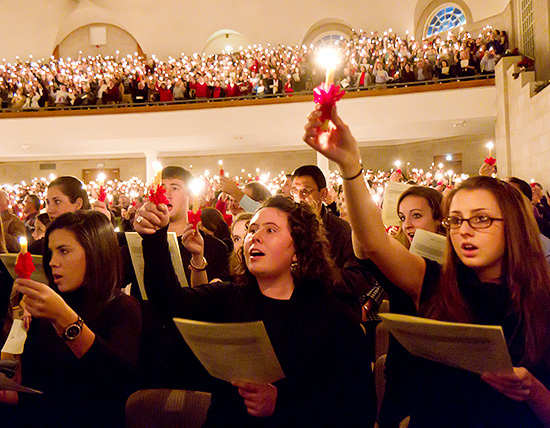 "Members of the campus community participate in the annual Christmas Lovefeast, a traditional Moravian celebration, in Wait Chapel on Sunday, December 5, 2010." Honorable Mention (256 pts.) - "Blue Bridge Big Bang" by Martin Vloet, University of Michigan. 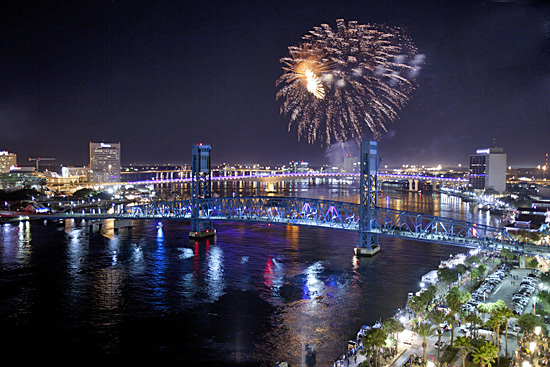 "Fireworks light up the sky above the Main Street and Acosta Bridges (foreground and background, respectively) in Jacksonville, FL, on New Year's Eve. City residents were joined on the Riverfont by college football fans in town for the Gator Bowl on January 1st.'" 1st Place (274 pts.) 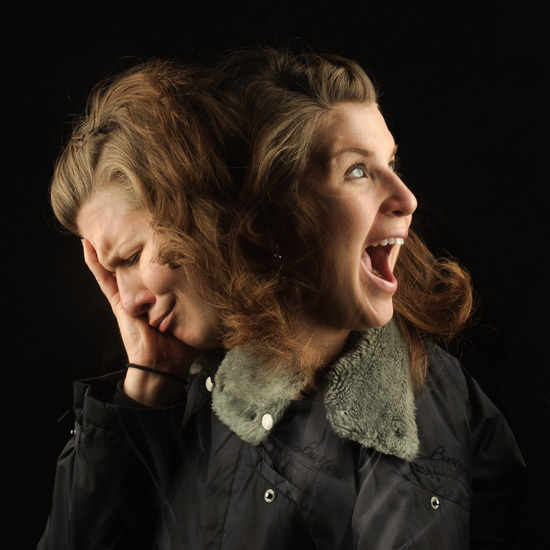 - "Split Personality" by Glenn Carpenter, Moraine Valley Community College. "Originally shot as an experiment in double exposure, this un-Photoshoped image was later used to promote Welcome Days and the counseling department." 2nd Place (259 pts.) 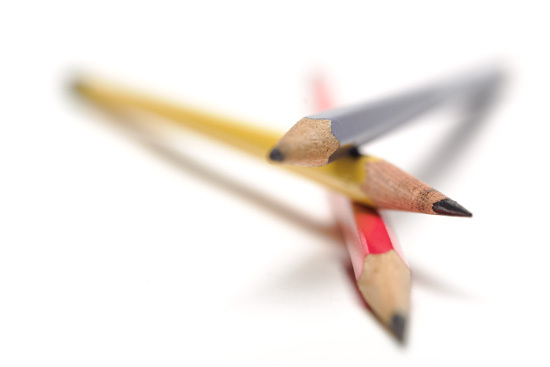 - "On Point" by Glenn Carpenter, Moraine Valley Community College. "Shot for the new course catalog." 3rd Place (251 pts.) 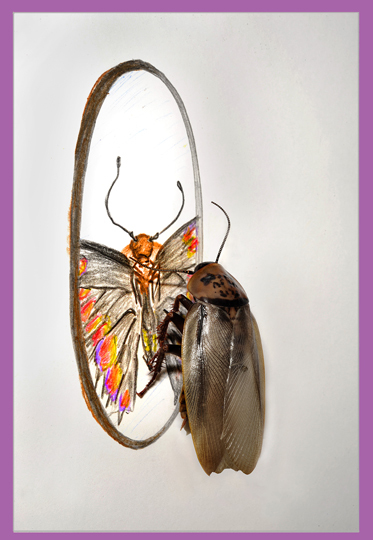 - "Mirror Mirror..." by Bob Elbert, Iowa State University. "Insect sees what it wants to see. Entomology Dept held Bug/Drawing Contest." Honorable Mention (249 pts.) 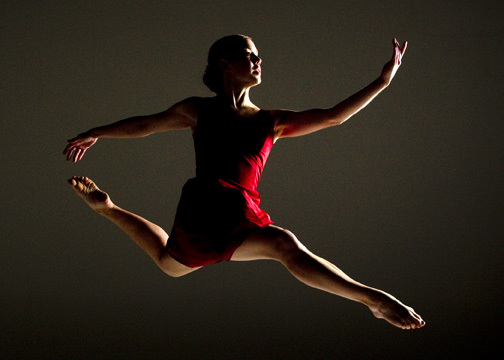 - "Leap" by Mark Philbrick, Brigham Young University. 1st Place (260 pts.) - "Purple Gold" by Mark Philbrick, Brigham Young University. "Chemist turn gold to purple on purpose. Professor Richard Watt and his chemistry students suspected that a common protein could potentially react with sunlight and harvest its energy similar to what chlorophyll does during photosynthesis." 2nd Place (259 pts.) - "Molecular Biology" by Trice Megginson, University of Wyoming. 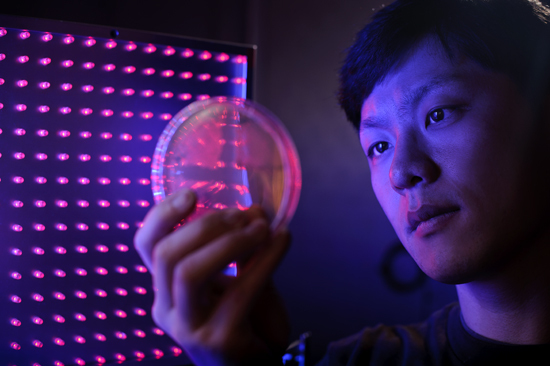 "Min-Hyung Ryu examines a specimen in a molecular biology lab." 3rd Place (244 pts.) - "HSX" by Jeff Miller, University of Wisconsin @ Madison. 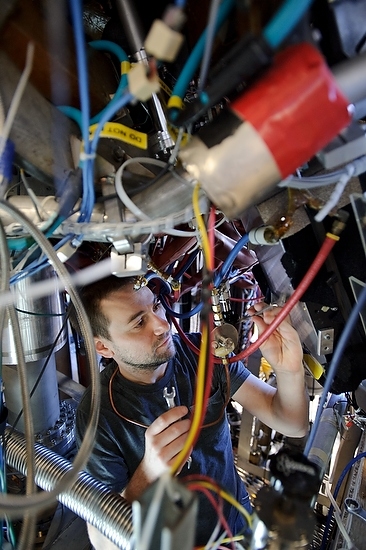 "John Schmitt, a postdoctoral student in electrical and computer engineering, performs maintenance work underneath the Helically Symmetric eXperiment, or HSX, in Engineering Hall on Dec. 7, 2010. HSX is a fusion-energy experiment that uses powerful magnetic fields to both confine and drive plasma -- a conductive state of matter similar to gas but containing ionized particles -- through a stellarator, a spherical device shaped like a twisted doughnut with a three-dimensional magnetic field." Honorable Mention (240 pts.) - "Blood Sssssample" by Bob Elbert, Iowa State University. 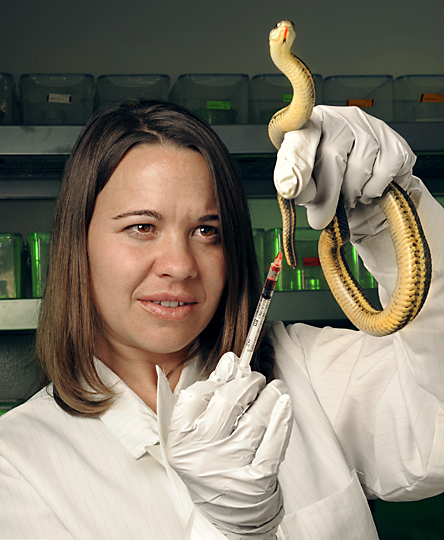 "Grad student takes a blood sample from one of her subjects for her research on stress and life expectancy of a garter snake species living in two different habitats in California." 1st Place (284 pts.) - "First Snow" by Peter Jakubowski, University of Wisconsin-Milwaukee. 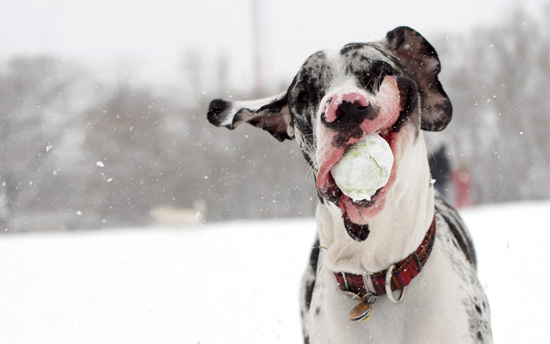 "My dog, Zeke, playing at the dog park during our first snowfall." 2nd Place (283 pts.) - "Zoo Ride" by Thomas Shea, University of Houston. 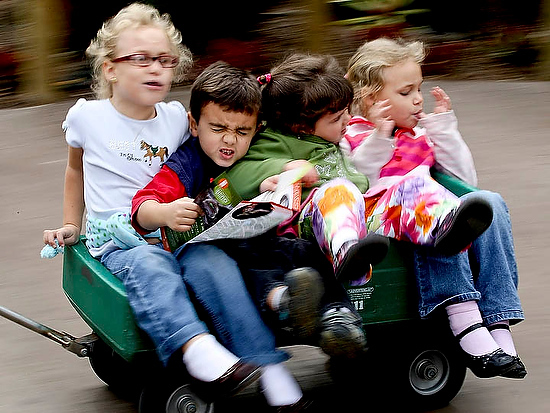 "1/23/11 : From left to right, Hannah Shea , age 7 , Will Hayes, age 6, Nora Hayes, age 4, and Sarah Shea , age 7, enjoy being pulled along in a Houston Zoo wagon by Don Hayes , Not pictured, while visiting the animals at the Houston Zoo in Houston, Texas on January, 23, 2011."